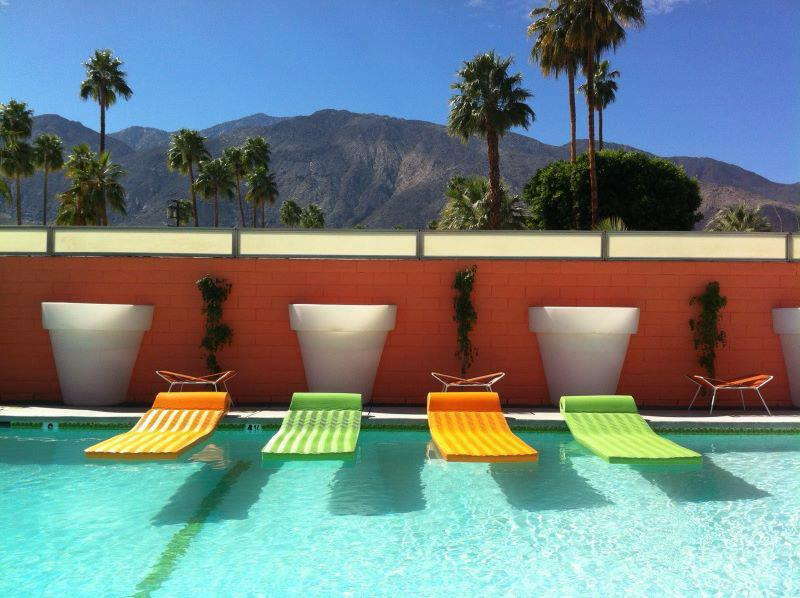 This clothing-optional boutique resort is designed with men in mind. 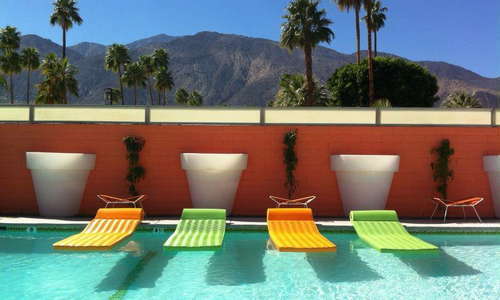 The property, a gay resort since the 1970s, was remodeled in the early 2000s. Century is a good option for couples who want to sleep soundly but like to be near the gay bars clustered around nearby Arenas Road or the parties at other Warm Sands hotel properties. The hotel offers a 10% discount to guests who book a return stay for two or more days within 12 months. An intimate property, with six rooms and three suites, all of the ranch-style rooms offer Wi-Fi, Keurig coffee machines, and sliding glass doors leading out to the sparking, swimsuit-optional pool. Pets are allowed in the three suites, however, only one dog is allowed to stay on the property at a time. Interiors are mid-century perfection, with geometric prints, bright colors, and period-perfect decor choices. The mod aesthetic continues to the bathrooms, which are adorned in either multi-colored tile or glass brick showers, with rain shower heads, gleaming white sinks and globe lighting. Bath products are from Shorty’s Barber Shop, a line of vegetable-based toiletries. With a starburst chandelier and shell chairs modeled after the Eames® classic, guests who appreciate design will enjoy the daily continental breakfast in The Century Room. As mentioned, no clothing is required at the heated pool or outdoor hot tub. Both the pool’s patio and The Century Room are available for private parties. The daily breakfast offers a variety of breads, cereals, fruits, juices, and coffee. 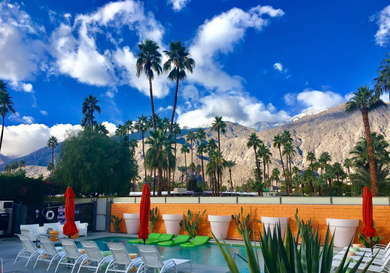 Century Palm Springs offers free on-site parking. Downtown Palm Springs is about a 15-minute walk and about a 20-minute walk to the scene on Arenas Rd. All of the hot spots of downtown Palm Springs are within a 10-minute or less drive. For a buzzy, almost Miami vibe, check out Lulu’s California Bistro (5-minute drive), which offers an amazing brunch deal. If you’re craving something casual, the Jewish deli-meets-diner vibe at Sherman’s Deli & Bakery (4-minute drive) is as terrific as the sandwiches and desserts in the case. For a lovely dinner with friends (and a decent wine list), try Zin American Bistro (6-minute drive), which also has a sidewalk patio. Blackbook Bar (3-minute drive) is a cool, casual spot, without being divey. The bar is well-stocked and the kitchen is good if you need some bar snacks to keep you going for a long night out. For dancing, Hunters Nightclub (3-minute drive) has theme nights and a DJ. 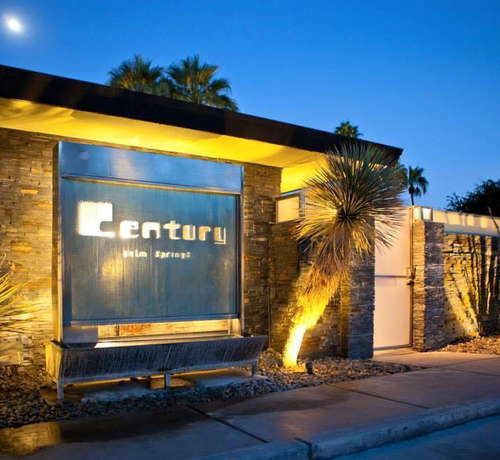 For established, professional men and couples, the aesthetic at Century is hipper than some of its Warm Sands contemporaries. The 1960s oranges, teals, aquas, and whites are a little bit Jetson’s, a little bit Laugh In. Though it’s not as much of a party spot, it’s affordable, with a neat history and geared toward curating a repeat clientele.